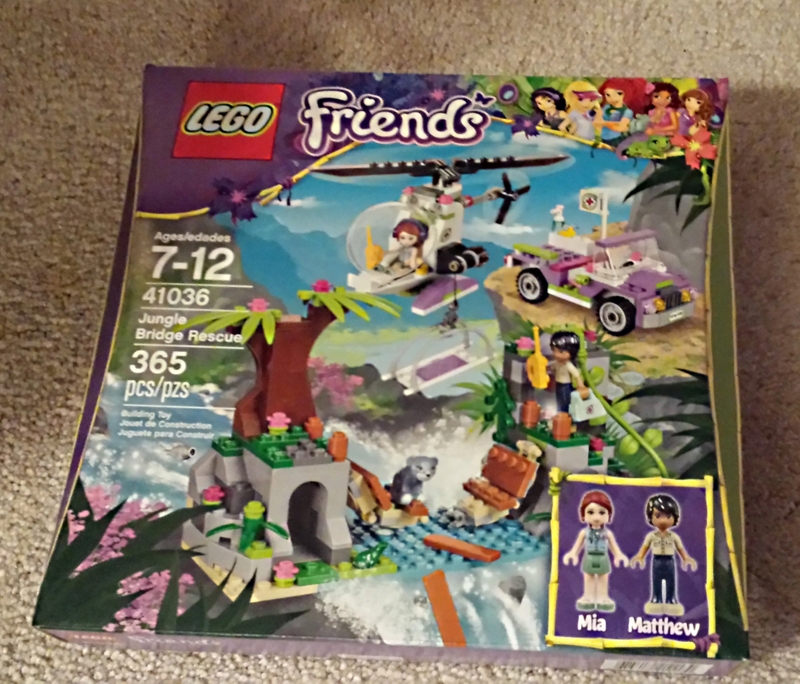 The Friends Jungle Bridge Rescue LEGO kit (41036) will provide hours of fun and entertainment for you and your kids. 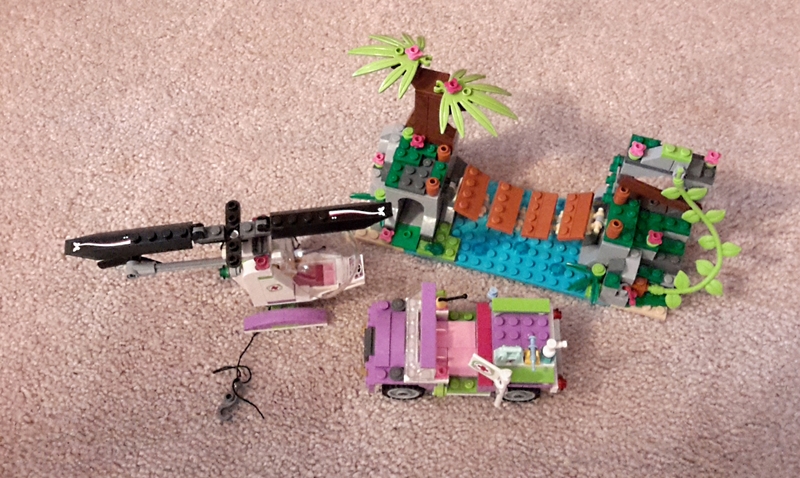 Intended for ages 7 to 12, the Jungle Bridge Rescue LEGO kit retails for $29.99 and includes parts to build an offroader and helicopter. It also comes with mini LEGO people – Matthew to drive the offroader and Mia to pilot the helicopter. The baby bear who needs rescued comes with the LEGO kit, along with numerous accessories such as a syringe, disinfectant, frog, fish, gems, headset and walkie talkies. Kids build the helicopter and offroader plus a rope bridge where baby bear gets stuck. Mia lowers a stretcher to retrieve the little bear, and Matthew uses a medical kit to check him out. Mia’s helicopter has a cockpit window that opens, along with a lever and moving rotor. After the rescue mission, Matthew and Mia can explore two rocky cliffs with caves and steps. Removable planks span the rope bridge, and the LEGO people can use a flexible vine to move around the cliffs and explore the caves. My 10-year-old thoroughly enjoyed building this LEGO kit. Her 5-year-old sister couldn’t wait to play with the bear, LEGO people and accessories, plus the completed offroader, measuring about 1″ by 1″ by 4″, and helicopter, measuring roughly 3″ by 7″ by 2″. Completing a LEGO kit installation of this size takes quite a bit of time – probably at least two or three different sittings, unless your child has the patience to devote several hours to one task. As with other LEGO kits, the Jungle Bridge Rescue building set offers a colorful and creative building set that’ll fuel your children’s imaginations, hone their spacial intelligence and improve small motor skills. 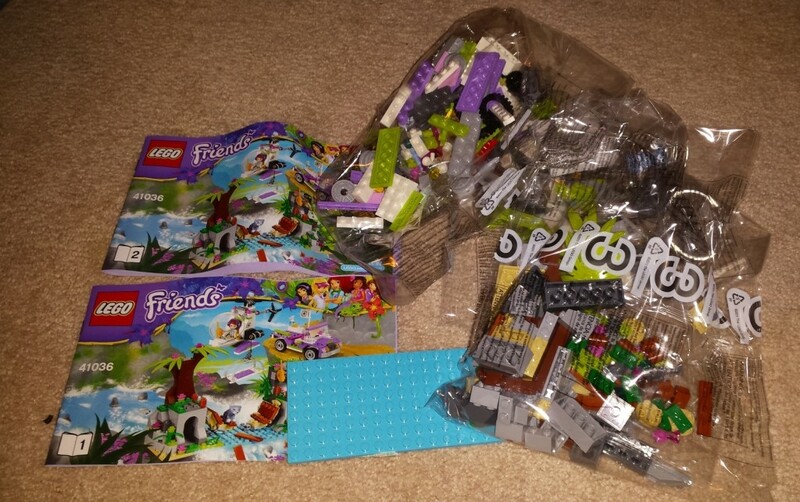 Since LEGO kits contain dozens of small parts, you may want to sort the LEGO blocks by color into sandwich-size zipper bags and keep the mini-dolls, accessories and larger parts in quart-size bags during the assembly process. Kids should complete the assembly on a firm, stable surface, preferably a lightly colored one to help in keeping track of all the tiny pieces. 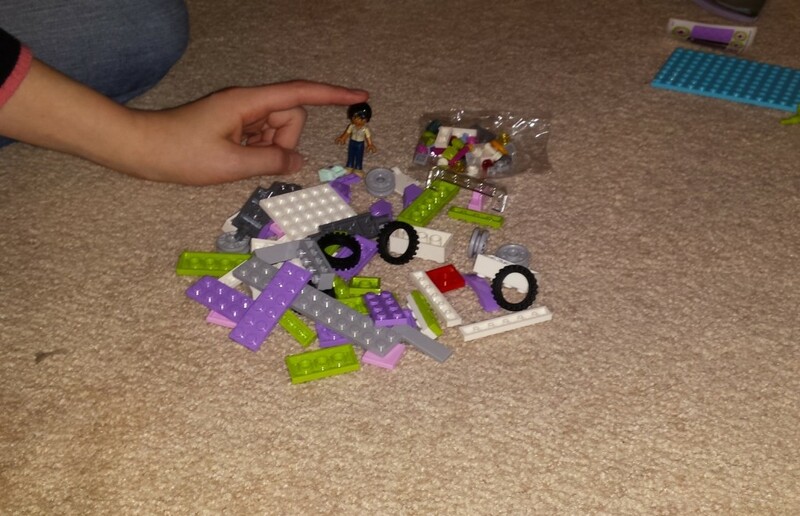 Little LEGO parts can easily get lost in furniture or left on the floor for someone to step on later. Stepping on a hard, plastic LEGO piece without shoes on is definitely something you want to avoid. 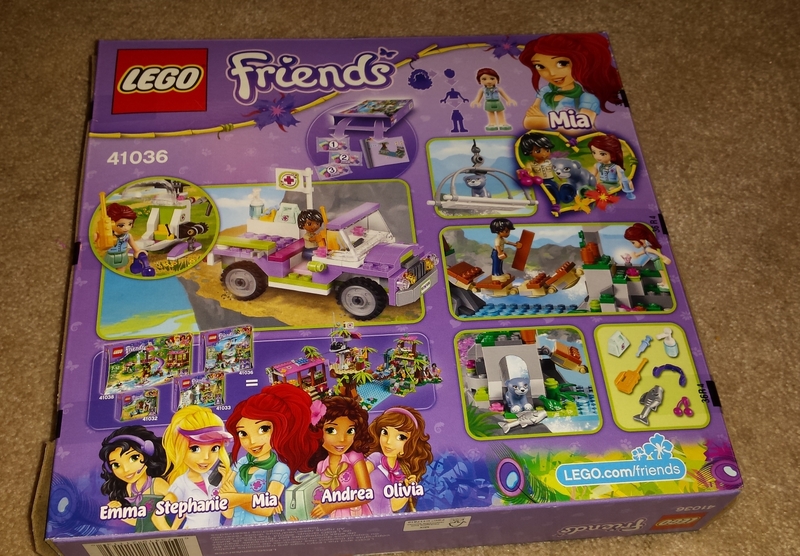 The LEGO Friends Jungle Bridge Rescue building set comes with great instructions and full-color illustrations. If your kids love LEGO toys, you can sign them up for the free LEGO Club, which includes a complimentary monthly LEGO magazine subscription. If you’re interested in some educational and exciting indoor entertainment for the kids, especially during school breaks and cool winter evenings, check out the impressive variety of available LEGO kits. There’s something to pique almost any kid’s interest. See a video of this cool LEGO set here. I received a demo product in return for this genuine evaluation. Amazon Christmas Giveaway: Win a free $400 Amazon gift card!